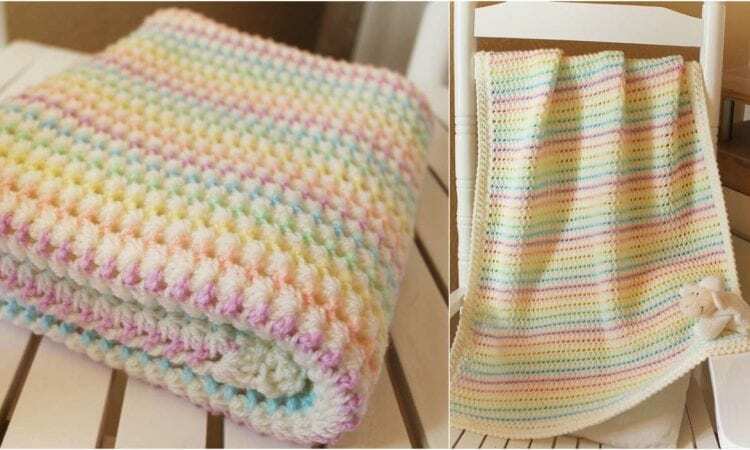 Beautiful spring blanket will be perfect in baby crib or stroller. Adorable colors will go along with any baby outfits. Blanket is approximately 33.5″ x 27.5″, but you can easily adjust it if bigger size is needed. For more free designs every day follow us on Facebook. A link to a free pattern is below. Starlight Baby Blanket – visit the free pattern site. Don’t forget to Like us on Facebook. Share your ideas and your work on our Facebook group! I have opened and printed out this starlight baby blanket pattern. went back to reopen it to get a good close up picture of one of the border rows and was denied access. help please. making for a gift. I just purchased the yarn for this blanket and now the pattern has been taken down. I am so sad that you had to close your blog, is there anyway for me to get the pattern? I’ve searched everywhere for this pattern, please help me find it! I love it!